My uncle, John Arthur Stump, who was my father’s youngest brother, died on January 20, 2006. His memorial service was held at a Vedanta monastery in Hollywood, where my other uncle (known there as “Jnana Chaitanya,” but to me as Uncle Dave) serves as a monk. I was not at the ceremony, but my family brought back some memorabilia from the service and from Uncle John’s “estate,” including a large piece of paper densely printed with musical notation. 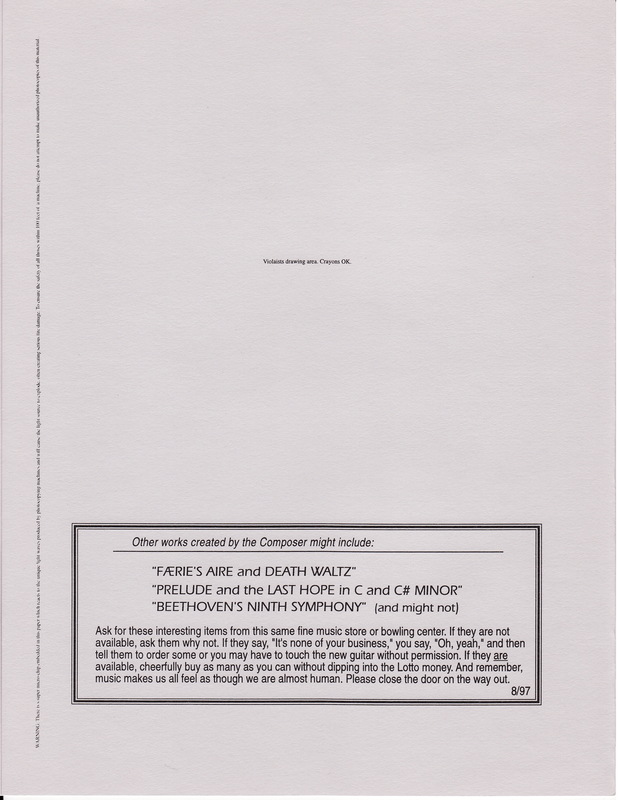 It was a sheet of music for a work entitled “Faerie’s Aire and Death Waltz (from ‘A Tribute to Zdenko G. Fibich’)” that John had put together, obviously as an unplayable and satirical parody. The notations on the score included absurd directions such as “release the penguins” and “Like a Dirigible” and “Gong duet.” It was an incredibly creative, erudite and rigorous act of nonsense, which felt completely consistent with other creations I had seen from my uncle. He was famous in our family for his non-sequiturs (sending a sympathy card from a fictitious professor to me on Christmas), stippling artwork, and his fascination with music. He had worked in the field of “music engraving” for most of his life, beginning in 1967, and I remember looking with fascination at his “music typewriter” in his office in my grandmother’s garage, so it didn’t surprise me that Uncle John would have created something like this fake musical piece. What surprised me was the fact that this piece was actually something of a musical legend, but to my knowledge, Uncle John had never mentioned it to anyone in my family before. When I received the copy of “Faerie’s Aire,” I showed it to one of the college students I worked with who was a music major (who has become a talented composer in his own right!) and he told me he remembered seeing this piece posted on the band room wall when he was a high school student…in Washington! I asked some other musician friends and they all told me they had seen it as well. When I searched the internet, I found it rife with references, accolades, imitations, and questions about the mysterious composer, John Stump. It saddened me to think there was nothing that revealed anything about my Uncle John’s life in the public sphere, so I thought I would provide some facts & anecdotes here that could serve as a source on this brilliant, hilarious, and reclusive man. John was born to Homer & Mildred Stump on March 24, 1944 in Kansas City, Missouri. He grew up in Lakewood, California, studying composition and orchestration at Long Beach City College. John also attended Cal State University Long Beach, where he played French Horn in an orchestra led by Aaron Copeland. The only known composition of John’s to be publicly performed was a three-part work for men’s choir based on the Dylan Thomas poem “And Death Shall Have No Dominion” (of which I have a cassette recording somewhere) which was put on by a choral group at the Vedanta Society in Hollywood. He also wrote “A Suite for Four Trombones and Four Trumpets” and he mentioned to me that he had written a pop song for Karen Carpenter (he knew a friend of her’s through CSULB) but nothing ever came of it. Finally, John was a large man…by that, I mean profoundly obese, which may have contributed to his public shyness. I often felt like he actually had something of a disdain for society and didn’t care what people thought about him, but to those who knew him, he was a thoughtful, funny, and brilliant man. It’s sad that he was never able to see his talents and creativity celebrated while he was alive…perhaps he would have preferred a mysterious posthumous legend to any kind of recognition in his life. Whatever the case, I applaud you Uncle John and happy 66th birthday on the 24th! UPDATE: I have posted more material and images regarding John here. Enjoy! Sources: some background information taken from John’s obituary in “Vedanta Voices” Vol. 8, No. 3, March 2006, along with John’s “A Family History”. -Here is a copy of an obituary from page 3 of the Glendale Focus newspaper, Vol. 3, No. 2 (February 13, 2006) written by the publisher, Gary Kemper. Unbelievably, I forgot to post the link to the authorized site of John’s works. I’m not exactly sure who this money is going to, but that doesn’t totally matter to me. 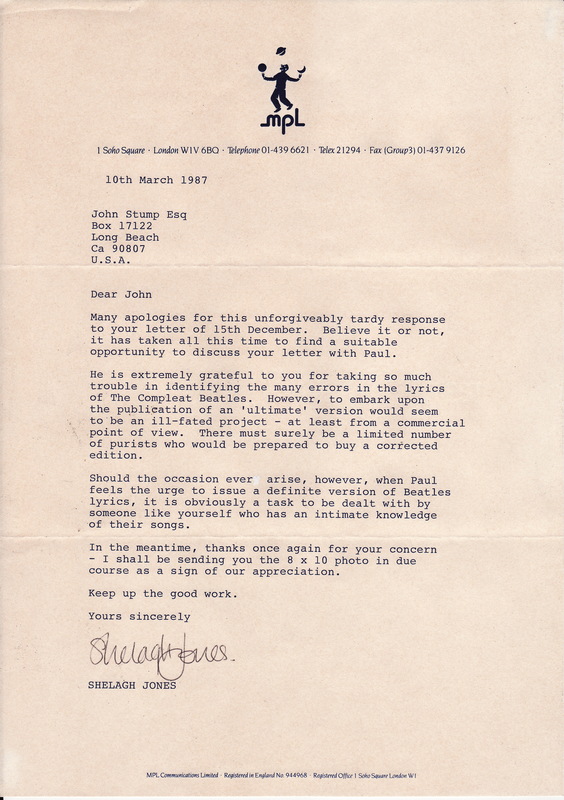 An apology and explanation for people who sent enquiries to this address and johnstumpmusics.com – Some I have responded to, but for the last 2 years incomplete understandings of the “authorized” copyright issues have been “hung fire” and I have not been able to appropriately respond to many of John’s fans requesting reprints of his known pieces. “Our” long term purpose is to actually get Johns wonderful “serious” music compositions published, performed, known and appreciated. This is his complete legacy – not only the hilarious delight of the immortal “Faerie’s Aire and Death Waltz” et al. Dear Greg, thank you for this article- I’ve been long aware of the entire mess between “Faerie’s Aire” being confused with ZUN’s “UN Owen was her?”, but due to the near impossibility of the original music sheet, I had never managed to even guess what the actual Faerie’s Aire would sound like- until I found attempts at playing it on this comment section! If I may make a suggestion, would it perhaps be wise to add a small paragraph or sentence, right at the start of the article, perhaps above the sheet even, explaining that Death Waltz is not UN Owen was her and there was a big misunderstanding? very nicely said my brother. John told me at one point that he started putting on weight during the Vietnam war. he was concerned about the world, and the possibility of going to war, and it sounded like he was afraid of being drafted. i think the weight gain may have been an unintentional way to avoid the draft, but i think it also secured him in the role of obscure, anti-social man of the world. and i agree, that he probably prefers posthumous praise to a lot of recognition in his lifetime. thanks for revealing his work being in a band room … do you know what year that was that your student saw the poster? It must have been around 2001 that my RA saw the work in his band room…I’ve had so many people contact me because of this post who also remember seeing it when they were younger. It’s so fun seeing Uncle John’s creativity cracking people up…miss you cousin! I admire what you’ve done here, Greg. I hope more people see this blog. I’ve always wondered about the mind behind the madness, and I have to say this has been one of the most intriguing blog posts I’ve read in a long while. It must have been pretty amazing knowing him, I know I would’ve given anything for a chance to meet him and talk to him. Incidentally, I’ve been looking for that first page of the Motoring Accident piece you’ve posted here for a while. It always bugged me how I didn’t have the whole thing, but now I’ve finally completed my ‘collection.’ I’ve got basically all of these framed in my practice room, and it’s a nice bit of comic relief when I’m intensely woodshedding a piece. And seriously, thanks for taking the time to alert me to this post. It’s either a small world or I’m just darn lucky. Glad it was helpful & it’s been cool to shed a little light on who John was (incidentally, today is his birthday!). of course they can .-. its so easy and it can be played by one person!!! They make a very brave attempt and carry it off nicely. This has been quite a fascinating story! What was John’s day job? I have lived in Kansas City since 1967. Just wondering where he lived as a child and when he moved to California. Do you know if John knew John Cage, composer of avant-garde music? Thanks for putting all this interesting information, Youtube video and the visual part of his music on the web. John worked most of his life as a music copyist and engraver, but always had some odd jobs as well (I remember him selling brooms for a period) and was working as an office manager for the publisher of a local Glendale, CA newspaper, who was an incredibly kind and generous man to John in his later life. John was born at St. Joseph’s Hospital and lived on South Benton in Kansas City, but the family moved to California in June of 1947, so he was only 3 when they left. You’re welcome for the information–it’s my pleasure to highlight John’s accomplishments…meager as they seemed at the time! Wow! i’m so glad to find this! I am so amazed by these manuscripts. As an artist and musician, I admire it all from both aspects: as pieces of art and amazing, hilarious! music. Is there any chance of getting posters or prints of anything? It was the reference to Zdenko Fibich that pulled me in. That was an enjoyable article to read. John Stump’s a real card. Of course, there should be a piano 4-hands arrangement of the Faerie’s Aire & Death Waltz, presently. The Radical Faeries may be the place to consult, next. 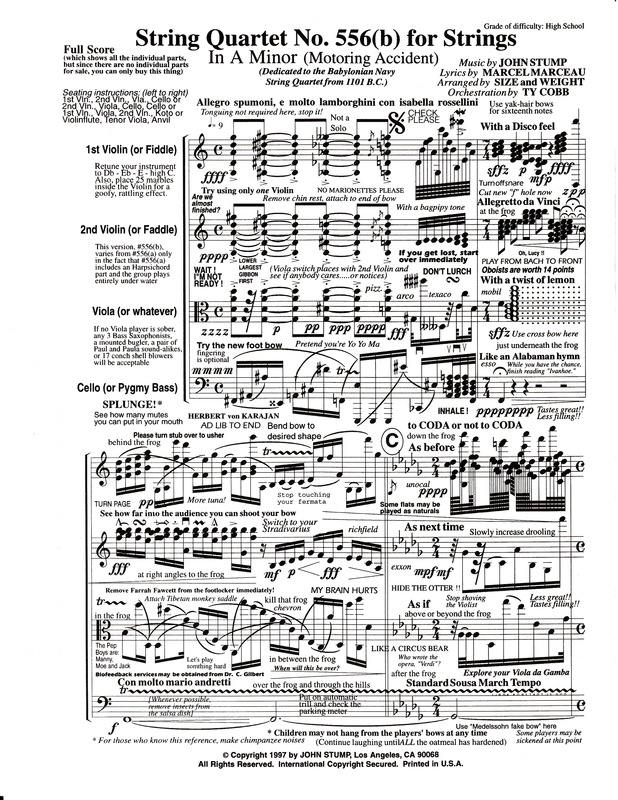 I first encountered the “Faerie’s Aire and Death Waltz” in about 1999, when I was a freshman in high school. Since then, as a college student and as a graduate teaching assistant in a university music department, I’ve discovered that virtually every competitive pianist, band geek, and touring chorister in America (that is to say, all fairly serious young music students) have run across this piece at some point. Furthermore, they all love it. It is great to have some information about the man behind the work. I am preparing a talk, believe it or not, on the wonderful music of Zdenek Fibich. The piece that John wrote in “tribute” is simply hilarious and I was elighted by the performance on Youtube. Incidentally, Fibich is certainly one the very finest writers of melodies of all time and the world is the poorer for his early loss (1850-1900). Is anyone managing the http://faeriesaire.com web page? I sent an e-mail months ago and received no reply. I sent another one today just in case. All of Mr. Stump’s work would be very popular if it were offered in a re-printing. HI…any idea where poster of John’s art may be purchased? Shoot, I have no idea…perhaps some other more musically adept reader can help you out with this. Thanks for putting the question out there! There isn’t a wrong note anywhere in the piece, and anyone who says otherwise is obviously not of the caliber of genius required to understand these amazing works. This is a heartfelt tribute to a man I had only known as a one-off joke-writer. Fascinating, detailed, and lovely. This man is an example for any composer. I had never heard of these before today. I now have a new obsession! Thanks! Thank you so much for your story, and may your uncle R.I.P. It is being done for fun by a group of music professors and is well worth a visit. I really wish I could, but I was unaware of its composition until after his death! I will check in with my Uncle Dave because he was closest to Uncle John and probably could offer some guess. It does seem like the Prelude and Last Hope was the earlier piece (1971 copyright), the String Quartet 556b was later (1997 copyright) and Faire’s Aire was probably in the middle (my copy has 1994 copyright). There used to be a website, but it appears it has gone offline. I’ve asked my dad to look into the copyrights on John’s work so that somehow we can make it available if people such as yourself would like a poster-sized copy. Thanks for the question and I will send you an update once I know the status! Is it possible if you could flag it as inappropriate, because it infringes your uncle’s composition copyrights? This video is indeed a disrespect to both your late uncle and the original creator of the song, while a unscrupulous poster is probably making advertisement money judging by the video view count. Many thanks. I take a very contrary view. I really do think that this visualisation and computerisation of the notes is brilliant and actually helps the listener to appreciate the music. After all, no human being could ever perform the music, or could only do so so slowed down as to make a nonsense of the composer’s intentions. Let’s not forget that these musical works were clearly intended to have a distinctly humerous flavour even though they are genuinely “possible” works. Therefore to have this rendition performs an essential and highly valuable service. Please, don’t get stick in the mud about this – it’s great! I should have added to the above, of course, that what is needed is a correction on the posting, becaused the piece played is most certainly NOT the Faerie’s Aire and Death Waltz! Is it another piece by John Stump? It is brilliant enough to be. Peter, the correct name of this song is “U.N. Owen was Her”, remix by Cool&Create, piano version. The original author is Japanese composer Junya Ota, who goes by the alias of ZUN. He is known for his Touhou series computer games, from where the music comes from, which are extremely popular in Japan. More specifically, this bgm is from the game Touhou6: Embodiment of the Scarlet Devil. He is a very exceptional case because he is famous for single-handedly designing and programming his games AND composing all of the soundtracks, including this one. Thanks for the identification on that piece…it’s very helpful in light of some of the questions and comments showing up here. THanks for putting me right on the identity of the piece. I wonder if someone could produce a computerised version of the various Stump pieces? That would be tremendous. I am a huge fan of your uncles work. Your uncle single handedly made my 8th grade band teacher quit! I’m not even kidding! We showed it to her, she tried to play it, she broke like 10 strings in the piano, and then quit! The excellently terrifying mind of John Stump keeps my randomness from overcoming me and depressing others. To contemplate his cleverness and musical humor is to know God, I am sure. Can I just add myself to the list of people who’d like prints! Amazing. Wonderful! I just discovered the Faerie’s Aire and have been laughing for a couple of days now. Such a great piece of humor. I believe it to be an accurate holographic picture of the world. 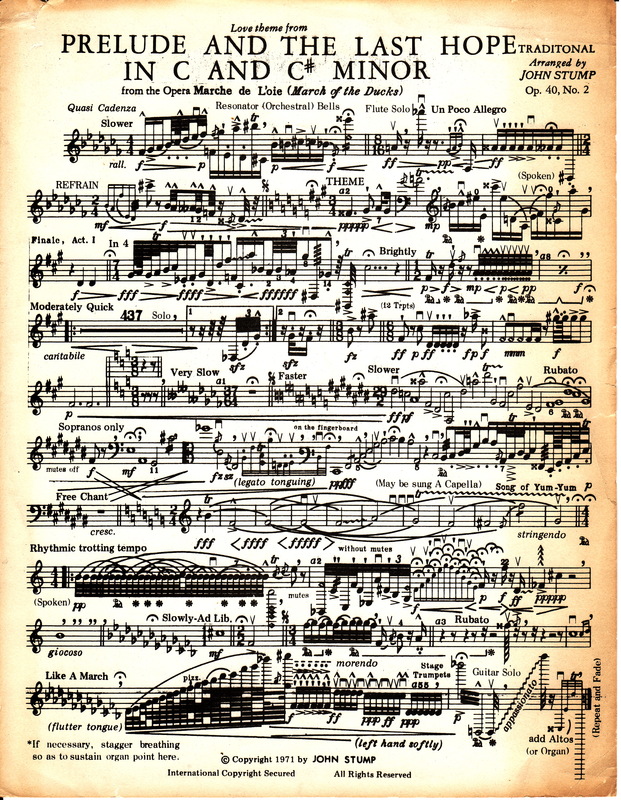 We are all given a piece of music to play that looks roughly like this. Perfect fulfillment in life comes by playing the piece flawlessly. You can be frustrated your whole life because it is impossible to play or you can sit back and laugh and cry hysterically, alternately in a quasi-beatlesque manner, crescendoing in a massive release of the penguins. Thank you, John Stump! Hope to meet you in the resurrection. have we determined yet if the http://faeriesaire.com/ website is a legitimate way to purchase prints of this music? Slowly working on checking this all out. Thanks so much! 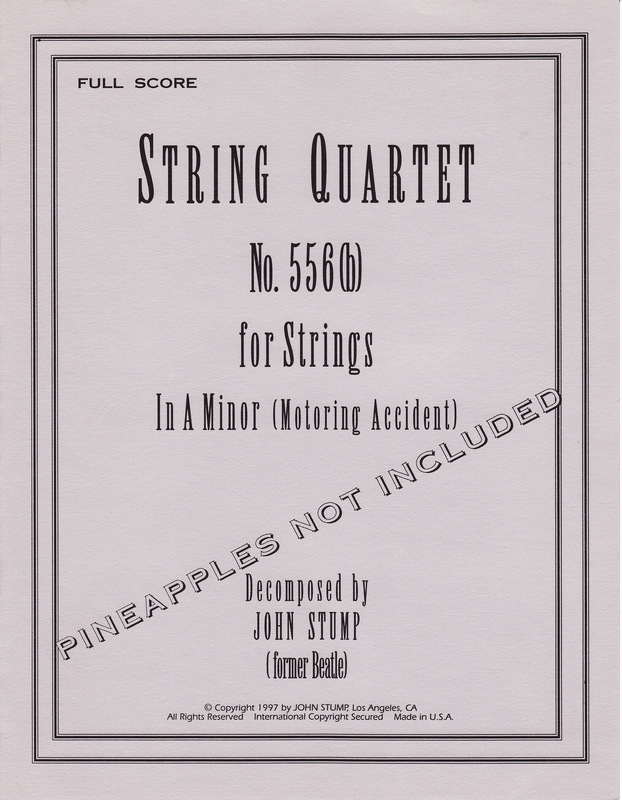 I learned about Faerie’s Aire and Death Waltz in 8th grade, but due to some blogger who happens to (at least they used to) receive the first listing on Google image search, thought that the second page of String Quartet 556(b) was the second page of the Faerie’s Aire and Death Waltz! I do not know how common this misconception is, but again, thank you very much for posting this music, with correct information about its origin. These songs are so hilarious! I’m glad to help clear anything up that I can! I’m constructing a very large website devoted to the string quartet (http://www.quartetweb.org). On it you will find reference to John Stump’s legendary effort. I’d like permission to post the pages of the string quartet (!). I’ve admired this piece of side-splitting musical humor ever since I saw it. I am using Faerie’s Aire for my final project in my class on satirical literature. To me, in addition to being extremely funny, this piece raises many questions about the nature of art, music, and beauty in relationship to human effort and skill. It seems that your uncle was a wonderful person. I wish I could have met him. I have only just begun my project and hope to share it with you when I have completed it. We would love to see this! Thanks so much for the comment & insights!! There is a piece from a 2002 game called “U.N Owen was her?” that is so very much alike “faeries aire and death waltz” that I find it hard that the latter is not a work of plagiarism. Don’t pay attention to the instrumentation but at the melody. Try searching for a piano version and listen to the similitudes. I noticed the similarities myself too, it’s clearly plagiarism. But they say it’s not art unless you steal it. Now for real art, look at John Stump. I am a fifth grader attending P.S. 334, the Anderson School, in NYC. I am doing a school project on John Stump, and would like to learn more about him. I wonder if I can communicate with you offline, as a phone interview would be ideal, but if not, I could simply send you some questions that you could answer. I would be happy to answer any questions I can & will contact you at your email to set up a way to get in touch! Hey, your uncle’s work is awesome.I salute him ^^. to be your uncle’s work.I know thats not true.Don’t you think thats totally ripping your uncle (and the original composer) off? Thanks for the heads up. Someone has already commented on this and my responses was basically that it seems like someone just used the term “Death Waltz” to describe the piece that you see/hear on YouTube because John’s work was so incredibly complex. 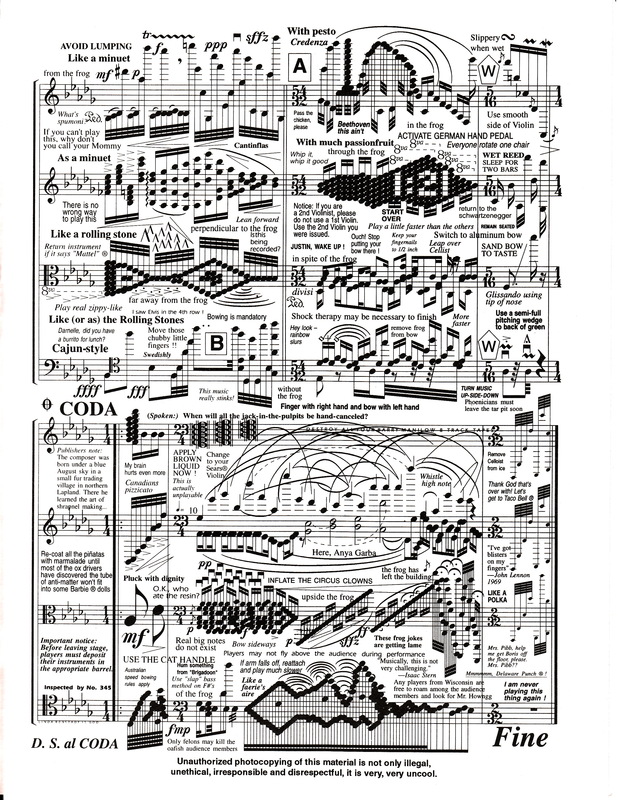 I don’t actually read music myself, but it seems that what you see printed on the page would not sound anywhere as melodic as the piece on the video. It would be rather interesting if someone plugged in the notation of John’s actual score to some kind of MIDI computer-device and created a version of what it would actually sound like! Wow what a powerful and forming narrative! Thank you for sharing. Don’t forget to include a complete profile on your http://www.geni.com pages for your family to share in the future. 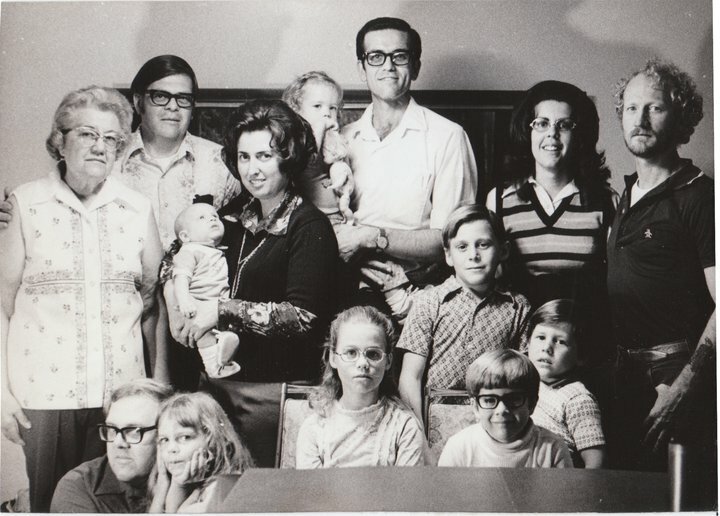 This site is free to share about your genealogy. Good job and thanks for sharing about your uncle. I forwarded the link to my family and also linked to my Facebook. Uncle John is now officially international! You’ve done a wonderful job on your piece…thanks for citing the article in your post and for sharing this info in one of the most beautiful languages spoken! I was bummed that the Wikipedia page disappeared…we’ve had about 75,000 hits on this article, so obviously some people out there are interested. It’s just that there is not much “official” to confirm John’s significance. Am I the only one here who realises that ‘Death Waltz’ is the second part of the full version of U.N. Owen Was Her?? This man was an absolute genius. His compositions are praiseworthy to say the least. Rest in peace you beautiful man. I sent an email to the address connected to this post…if you don’t get it, just let me know! Hi, i was just searching youtube because I absolutely LOVE listening to piano music, and i came across Faerie’s Aire and Death Waltz…. FAR OUT, it is my favorite ever piece, i can’t even put in to words how much of a wonderful mind the composer must have, it is AMAZING, at the moment i’m not very good at the piano, put i’m getting lessons next term(so excited!) but one day, i am going to play this!! This video, http://www.youtube.com/watch?v=cysRztrR1G4, is not John Stump’s Death Waltz. It is a piano cover of the song “UN Owen was Her?” by the Japanese game designer, Junya Ohta, aka ZUN. it’s not plagiarism. the song that you hear on Youtube “UN Owen was her” which was mistitled by some moron. if anything, John stump actually benefited from the mistake since more people have heard “UN Owen was her” and thought it was death waltz than have actually heard the real deathwaltz which was, lets be honest, more of a joke than an actual song. I found Death Waltz by accident surfing youtube. Now I’m addicted to it. This song is absolutely amazing. I’m glad to have found this article although I’m sad to find that John is no longer with us. I’m sure he’s in a better place. I will continue to listen to this song for many years to come. Cheers! Thank you so much for sharing this. Just heard a friend of mine play the “light” version of Death Waltz on his piano, thus presenting me with John Stump. I’m in awe and amaze. Where can one find his music? Thanks. Am I the only one seing the “HELP ME” in one of the sheets? Thanks for getting in touch! I will write as soon as possible! This was a mind-blowing read – I am a professional musician and “Faerie’s aire and death waltz” have been part of the humour strain of the profession since I was in the school band. I’ve also encountered the “Prelude and the last hope”. I was intrigued by your mention of a work for voices by John Stump – and even more by the “Suite for four trombones and four trumpets”. If this is from the playable end of John Stump esq., it would be a spectacular sensation to get access to the material for a performance. Do you know the whereabouts of the material, MS or printed, for this work? Thought I’d ask you before I turn to http://faeriesaire.com/. Guys. This whole thing is a fraud. The so called “Death Waltz” was composed and created by a guy named Zun The ACTUAL song is called “UN Owen Has Her” and is the theme song of a character named Flandre Scarlet in the Touhou games. I’m not sure but I’m willing to bet that if you were to do some real research you would find out the guy never existed. You’re dumb. The original “Faerie’s Aire and Death Waltz” was circulating long before the game was ever a twinkle in someone’s else. If you actually read the sheet before you talked such nonsense, you’d realize that the music noted on the sheet has about as much to do with the misnamed Youtube videos as a slice of pie. John Stump was a very real person, newspaper articles and obituaries confirm this. The story goes that someone misnamed their Synthesia video as the titular song (probably intentionally), a bunch of Touhou fans got angry off of what was obviously intended to be a musical joke, and now they flood the internet with their “corrections”, not realizing that the entire point of calling the song “Death Waltz” was to describe the difficulty of the song, not literally calling it the actual “Faerie’s Aire and Death Waltz” piece. Please don’t spread false information like this. It’s actually a remix of ZUN’s “UN Owen was Her”, “The Last Brutal Falndre Scarlet” by COOL&CREATE and not the other… It’s not really a fraud. Both of the notes look really different from each other if you bother to look, they just sound similar and some idiot mistaken UN Owen was Her with Death Waltz and got the two mixed up as one. Many of the more strange markings on his peices and especially the description on the back page of his ‘motoring accident’ sound extraordinarally like writing from Douglas Adams. (Anybody familiar with his books?) Very dry, sarcastic-type humor that one can’t find unfunny. I totally agree. John had an amazingly droll sense of humor. I’m not sure if anyone else linked to it, but someone on YouTube did attempt an actual performance of Faerie’s Aire and Death Waltz: http://www.youtube.com/watch?v=sCgT94A7WgI. It’s not bad. Here is another performance (piano only) of Death Waltz by a very talented high school musician. Considering some of the distractions around him, he must have very focused mind. It’s not Death Waltz, but still really cool! I just saw a snippet of Faeries Aire on Facebook, and had to look up “like a dirigible” to find out more about the whole piece. Thank you for this information!! This has brought a lot of joy to a lot of people, and your blog had added to the appreciation. I stumbled across this today and found your post fascinating and the original work just wonderful. The phrase “gradually become agitated” should appear in a lot more scores – usually 3 bars before a major solo. Thank you for this – you’ve done your Uncle proud. Thanks Chris! Glad you enjoyed reading the post. I’ve been looking for a large printed copy of the Death Waltz ever since I saw one posted on a high school band room wall years ago. I had no idea John Stump had other works just as funny. Please tell me where to get reprints. I found a copy of FAERIE’S AIRE AND DEATH WALTZ (form “A Tribute to Zdenko G. Fibich” at a garage sale. I found this website by accident, trying to find out what this music was and if it was worth anything? So, Therefore, how much would you pay for it? Looks like someone wanted to start another troll by calling another piece by John Stump. Some guy misnamed this piece as The Last Hope by John Stump. The real song is a piano version Night of Nights by COOL&CREATE which was a remix of Flowering Night which was also from Touhou. Whoever trosel7 is is probably a bad, copying troll. The misnamed The Last Hope = Night of Nights by COOL&CREATE = Flowering Night by ZUN. What’s next? String Quartet No.556 becomes a misnamed piano/string version of a Necrofantasia remix by COOL&CREATE that was also originally by ZUN? Looks like he changed the title. If you have not done so already, you should retain an attorney as to ascertain the ownership of this man’s catologue. Publishing rights and royalties could pay huge. This. This is why the internet must remain free, unrestricted – access to all. I would have never discovered this man, his works, his legacy. Seeing it, it has brought both laughter and a small amount of sadness – but mostly laughter. A great and humorous mind was behind these works, and without the internet, none of us would have the pleasure of knowing this. Thank you for publishing this. Thank you. I believe that the pieces shown above are still protected under copyright (and I am aware that using the pieces without getting your permission might not only be illegal, but that it would be also very, very uncool. XD)So, I would like to know whether or not I am allowed to share these wonderfully hilarious pieces of music with my band directors and friends once school starts this fall. so there’s a person behind all these??? not John Stump, not COOL&CREATE, not ZUN…. but who? Thanks for your all argument and finally there’s a point i missed. Thumbs up for John stump, COOL&CREATE, and ZUN!! Sandozz, look back up to the very top of this blog and you will see the pieces written by John Stump, a very real and genuine person. All his pieces are illustrated. Nearly all the performances you can find on YouTube are NOT by him but have been given wrong names and attributions. As you will see at the top, John Stump wrote his own music and has nothing to do with music by Zun or anyone else. Read the music and see the “fake” performances but compare them carefully and you will both see and hear which are the genuine ones. Okay! Thanks for all these! thumbs up again for The Death Waltz and U.N. Own Was Her…. two great songs! THANK YOU for this fantastic tribute to a brilliant, (sadly) reclusive man! I’ve had a copy of just one page of “Faerie’s” for at least ten years, and – quite apart from John’s real music – it is a work of musical-comic genius! A shame his real music was not performed and celebrated in his lifetime. But can’t we do something about the IDIOTS who keep posting comments here about unrelated music on the web, obviously not having bothered to read all the information above? How about deleting every post about the Japanese game music, except for one which explains the confusing situation? My oldest daughter has a great interest in music. She’s now 12 and can play a few intruments. She’s always searching for new inspiration. She found your Uncle’s Dealth Waltz on You Tube, and she had to show it to us. She thought it was so cool! What a unique piece of music. You and your family must be so proud! I was thrilled to find this blog and read about my old classmate JOHN STUMP! John and I were both Music Majors at LBCC in 1962/63, and in several classes together. He was a genius, and all of us in the Music Department knew it! Back in those days he was a very trim young man, not overweight at all. Our Music History teacher, Professor Gurnee, would often give us a special treat. He’d ask John to go to the blackboard (it already had a music staff on it) with a piece of chalk in his hand. We’d all quietly wait. Then Professor Gurnee would play a 33 1/3 rpm record of some intricate musical piece. John would rapidly write down the entire musical score, every part, every instrument, while the record was playing! He didn’t miss a beat…100% accuracy every single time! We all stared in amazement…no one else could do that, not even any of the professors! Everyone in the Music Department knew who John stump was…the musical genius! Thank you so much for taking me back, for reminding me of my classmate, John Stump. I’m so grateful to have known him. God bless you! ~ Theria C.
This post made my day! Thank you so much for sharing this memory. I honestly only ever met one or two friends that John had. He was pretty anti-social. Your story filled in this gap in his life just a little! I’d love to find out more stories sometime…I’ll email you if that’s all right. The original version was from 2002 in Touhou: Embodiment of the Scarlet Devil by Jun’ya Ota (ZUN), then, COOL&CREATE’s vers which was called 最終鬼畜妹フランドール・Ｓ (Final Savage Sister, Flandre S.) was released in 2004 as a remix version of the game theme. He is programmer, graphic designer and composer. At the entrance “music CD” can check the date of publication of the compocision (2002). Oh dear. Yet another person who cannot be bothered to read the whole article. ZUN has nothing whatsoever to do with the music of Mr. Stump. Just how a composition of Zun’s became confused with Stump’s “Faerie’s Aire and Death Waltz” we shall maybe never know. Charls V has made the same wrong confusion and is perpetuating a false myth. It might help if someone could actually make contact with ZUN himself. He seems to be the only one who can get through to the consciousness of some people! At first glance of the sheet music I would have guessed it as something by Peter Schickele a.k.a. PDQ Bach. Very similar sense of humor and notation style. Check out http://www.schickele.com/ I didn’t find any sheet music there but we did attempt some of it in band in high school. Reblogged this on C'est la vie. You need to know that “Fairie’s Aire” has been distributed around the world by every Jazz Band known to man.. Since then, I have proudly displayed my copy. Yesterday, a friend took a picture of it with his iPhone. Not realizing it is copyrighted, he posted a rather fuzzy version on the web. Aghast, I am now posting your websites and info on how to get a legitimate copy of Fairie and John’s other works. So amazing! His work truly ‘breaks the ice’ for us all. You can tell when a work is truly great, because upon beholding it, the viewer immediately considers it their own. Thanks for the story of your connection with John’s work! It is amazing how it’s travelled from the musical typewriter of an eccentric individual into music classrooms all over the country and into the hands of a Grammy-nominated performer! I will email you at the address attached to your post about copies. I’m yet another person who loves John’s work and would like to get printed copies. Please let me know where I can get them. I sent an email through the other web site; but if you don’t know where those are going, then they are probably piling up in a mess of electrons somewhere. “You can tell when a work is truly great, because upon beholding it, the viewer immediately considers it their own.” Beautifully stated – great insight – great for such an offhand provenance. I found your blog and the attachments captivating and really appreciate learning more about your uncle. I learned about his work from a musician here on the east coast who renamed his group Release the Penguins after the whimsical notation in Faeries Aire and Death Waltz. I am involved in a terrific Arts Center here in the Berkshires, Sandisfield Arts Center, that is featuring this group in our 2013 performance season. I was amazed when he told me he had renamed his group after just seeing the score at a workshop with Chick Corea he attended in 2010. I decided to tell the story about the band’s name change in publicity about the event and want you to see the story that features information about your uncle and your website and also the Creative Mutations story. I’m touched by the way your uncle’s memory lives on in these varied and interesting connections in our tumultuously changing and clashing world. I admire your blog and your own pursuits. While I converted to Judaism years ago, I attended a Christian Church as a child and considered going to Chapman College when I was 16. When I asked our minister at the time to write a reference letter for me to the University of California at Berkeley instead, he bemoaned the fact that I was now going to a “godless place”. But.he wrote the letter. If you send me your email, I’l send a pdf of my story about your uncle. Thanks so much for commenting and letting us know about this connection with the group playing at your arts center. What a fun tribute to name the group after that notation! Thanks for the personal note as well. I actually ended up going to Chapman (now University) for an MA in English Lit. But Berkeley would have been even better! I love being among “the godless”–they are often so much more interested in thinking more deeply and widely than many of my fellow Christians! I’ve attempted to play tis on the string bass! I got two notes n to realize there was no way for me to do this. Richard – I think you have to play it by ear! gerard hoffnung would applaud most enthusiastically! Are printed copies available for sale yet? Well, I’ve ready a number of the 170 Replies and don’t seem to see anything on getting non-fuzzy “original / authorized” prints, and it would be interesting to see what kind of serious music he wrote. So, pardon the repeat, but… anywhere to get any of the humorous or otherwise music yet, in “original / authorized” prints? Thanks for the interest in authorized prints. You’re absolutely right that this is still fuzzy. I’ve meant to follow up on this so many times…I will honestly make my best attempt to do so in the near future. Hi Greg, I appreciate your tribute here to your uncle and his work. I thought of Faerie’s Aire and Death Waltz today (although I couldn’t remember its title) and was happy to find your page. I also got caught up in some of your other music posts as I am a fellow Sufjan, Radiohead and Beatles fan, among other groups. In any case, I have a question regarding Faerie’s Aire that I’d like to talk to you about, and it would be best to do it off of this page. You can contact me through my web site at http://www.scatterbraintees.com Thanks!!! Hello, I am writing an article for an online journal and I am writing for permission to use an image of your uncles piece “Prelude and Last Hope in C-Minor.” If you could please contact me I would be happy to give you more details. Thank you so much and I hope to hear from you soon! We would like to use your uncle’s “Faerie’s aire and death waltz” score for the historical references section of the book. We would like to have permission from the rights holder to use the image. | Lost in the Cloud <Loved it! Thank you for this article- I’ve been long aware of the entire mess between “Faerie’s Aire” being confused with ZUN’s “UN Owen was her?”, but due to the near impossibility of the original music sheet, I had never managed to even guess what the actual Faerie’s Aire would sound like- until I found attempts at playing it on this comment section! I’m in the editorial team of the Some Magazine, which has found its place in the independent magazine world and has reached an international audience. We would like to incorporate your uncle’s work and life into the magazine. Dear Greg, thank you *so* much for creating this site in tribute to your uncle ! about his “music typewriter” or about Non-Sequitur Xmas Cards. These are like stories about Erik Satie. On another note, I would like to offer something unusual to John Stump fans. certificate for your uncle, or any other verified time of birth that is within 10 minutes of accuracy, I would like to offer a “team reading” of his astrology chart. his hand was his own choice, but it would be neat to see the ingredients he was given to work with ! However one is apt to regard astrology ( I know it is a joke to many people), the links that it points to between physical outer-world phenomena and feeling inner-world phenomena are very fruitful to question and contemplate. If you think about it, that is exactly the same thing that music provides for us ! What is the fascination that certain pieces of music hold on us? It drives us to try and express the ratios of the sounds in numbers and notations. Dragging things out of hiding and into the “knowable” part of our brains. If you agree to have a chart reading done, it would be done in the same gentle and droll spirit as the man who inspired it. I am still looking for high-resolution color-corrected printed (or printable) copies of this music. There don’t seem to be any downloadable images without issues with color, resolution, or parts of the sheet being cut off. If someone has a 600dpi high-contrast scan where the bars are horizontal, would you post it or let me know how to acquire them? I’m happy to pay something, and happy that John Stump’s heirs might benefit. I’m not interested in copyright infringement or bootlegging. But it’s been 5 years now and there are still apparently no decent copies of this sheet music available for sale anywhere. Thank you in advance for your help! I then paid one of John’s heirs a small publishing fee (because it was the right thing to do) in order to give occasional copies to my classical music colleagues. Now, whenever I contract string orchestra players, I slip a copy of “Fairie’s Aire” into their book of charts and tell them, “This is the first piece we’ll be performing today.” – then wait for their look of terror 🙂 Ha! Is there a digital copy I could purchase from you (or anyone else)? This would be for my own use. I will email you a copy, if it’s ok with Greg? There are many versions of a piano piece called Death Waltz in Youtube: https://youtu.be/Iankyw47vqY . Has it something to do with John Stump? Thank you so much! By the way, your blog is awesome. There are many versions of a piano piece called “Death Waltz” in Youtube, ¿has it something to do with your uncle? It doesn’t suite the score of Faerie’s Air and Death Waltz. I leave you a link: https://youtu.be/Iankyw47vqY. Thanks for your attention and congrats for the blog! A wonderful tribute to an artist in his own right. Thank you for sharing, and for responding to the comments that are being added years after your original post. My name is Yoshiyuki Kuwata from the HowFull’s Japanese TV production company. We are presently responsible for the production of a program called “Tamori Club”, which airs on the Japanese television network, TV Asahi Corporation. The program will be featuring a special section for “Complicated musical pieces in contemporary music”. and please specify any credit lines, fees, or other conditions you may require. I would also like to use the publicity photos of Mr.John Stump. If you could attach a permitted image, I would be very grateful. Again, please specify any credit lines, fees or other conditions you may require for the use of the image data. I would be very grateful for your permission. If you require any additional information, do not hesitate to contact me at the address and number above. Wow, so sorry for a six-month delay in response!! A whole load of comments just came to my attention back-dated to last year. In any case, my other uncle is the one who seems to be responsible for reprints, etc. I will see if I can post his information soon. 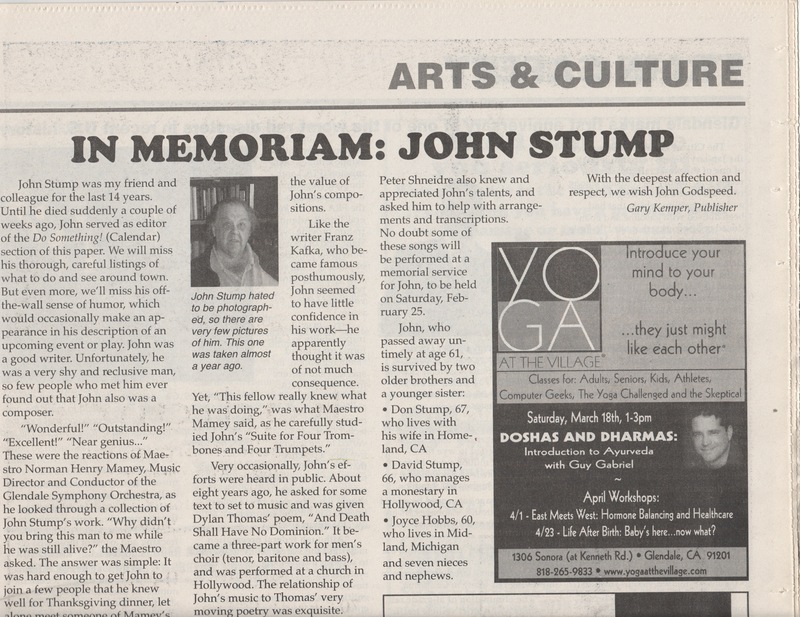 Thank you for this information about John Stump. Humor in music is great. Glad to put it out there & hear your response!